Manage by Stats (MBS) is an Amazon seller software used to extract data quickly in an easy to read display. You connect your Amazon account to pull in data which is displayed in charts and graphs. It’s not a full Accounting Software where you can extract a final report for your 2017 taxes, but instead, a tool to help sellers evaluate quickly to make critical decisions to propel their business forward. NO SKU LIMIT: Unlimited SKUs. Your business can grow without worrying about monthly price increases just because you add new items. SALES VOLUME: No limit. Don’t worry if you sell high priced items or if your business grows fast. 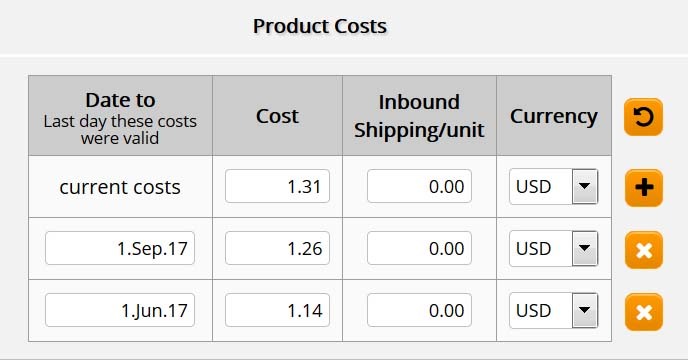 ASIN and SKU TRACKING: Enter Cost of Goods Sold (COGS) and your dashboard shows Profit Margins. Customize for specific time frames. MULTIPLE AMAZON SELLER ACCOUNTS: You can connect a 2nd Amazon Seller account. After two accounts are connected, there is an additional fee. As your business grows, you most likely will have a second account. ROLLING PRICES – HANDLES AVERAGE COGS: Has the capability for you to add 10 items bought for $1 each this month, and the next 10 items bought for $1.50 each next month, and so on. There is a cost of product field and options to handle a moving target or rolling price cost for your product. You can update past records, future records, etc. for your Cost of Goods values. Cost of Goods prices (COGS) are assigned by SKU. This way you can have different COGS for FBA and FBM listings and for various conditions of the product (New, Used, etc). Prices can also vary over time, so you can adjust COGS prices when they change. CURRENT and PRIOR YEAR STATISTIC DATA with GRAPHS: All statistical tracking displayed on your dashboard. Create your own “widgets” (called dashlets) to segment and track specific product types. Data is also displayed in graph format so you can visualize account performance fast. Easily import prior year records; records older than the last three months. INVENTORY LISTING MANAGEMENT: Import all current inventory with past sales data and track restocking. REPEAT BUYER TRACKING: All customer transactions can be downloaded with order ID and repeat buyer noted. REVIEW RANK TRACKING: Provides a free tool called WorkHorse that pulls in your latest review ratings. Monitor and immediately take action on low l star reviews. EXTRACT DATA: Group products by Brand, Product Line, ASIN, SKU etc. for download and further evaluation. AFFORDABLE: The monthly price is affordable, but there is also a bulk buy discount, so you can use the prepaid 6 month option or even buy 1 year access. This might be great if you are signing up in December and looking for a tax write-off, a way to increase your business expenses. Buy MBS for an entire year. AFFILIATE PROGRAM: Lifetime, ongoing (not a one-time payout) program where you earn commission on your referral’s monthly payments. Please CLICK HERE to buy through our affiliate link. PAYMENT HISTORY: Great for quickly evaluating account performance trend (Are sales going up/down) and also, beneficial if you are coaching clients on their own account and you receive a percentage of sales (easily calculate what amount is owed to you). OTHER GOODIES: Some other goodies dealing with email (1000 seller mail messages out), Customer Data Base Download and customization, and more. CUSTOMER SERVICE: Customer support Emails are usually answered in 24-48 hrs (business days) and if needed, request a phone call and get hands on assistance for your unique situation. TRAINING VIDEOS: Some of the best training videos I’ve ever seen. If you can’t stand videos that drag on and are full of fluff… you will love these training videos. Short and to the point with the exact ANSWER you need. No wasting of our precious Amazon seller time.